Nearly a year and a half ago, I sat down with a representative from a prominent hardware manufacturer. CES was winding down, a show in which 80 tablets entered the world to a massive shrug. He walked me through his company's three or four offerings, which varied in price and size and finish and sheen. Honestly, he told me, We're still trying to see what sticks. So many months later, and that's still the biggest question for Android manufacturers. And the answer has come in the form of some tablets so obscenely silly, you'd think they were a prank. But you know what? Thank goodness for the weirdos. They're paving the way for genius. Here's the thing about being an Android tablet manufacturer: You're playing from behind. You didn't have a legitimate operating system to work with until a year after the iPad launched. You still don't have more than a handful of optimized apps to offer your customers. And your firmware supplier might soon become your stiffest competition. So from a software standpoint, things are looking grim. Getting better with every update, sure, assuming your device ever receives it. The worst part, though, is that all of these things are almost entirely out of your control. Remember, though, that you're hardware manufacturers; something that becomes all too obvious with each painful skin slapped atop the latest Android build. Hardware is where you make your bones, and hardware is where you can compete. One problem: if you make anything too similar to the one model that's been proven to work, Apple's going to sue the silly out of you. Oh, and by the way, Apple's astronomical Apple Store margins make it nearly impossible to compete on price. So what's left? What options have you got if you want to be a player in this post-PC world? You follow IBM and Dell into the land of IT infrastructure. Or you get weird. Let's say this first: Apple doesn't have the final say on what a tablet looks like any more than IBM does the smartphone, or Abner Doubleday does a baseball uniform. The iPad is wonderful, it is the best. But we're at the beginning of a very long stretch of non-laptop computing. And the tablets we use 10 years from now will look as different from the iPad as your iMac does from an eMac. If you're an Android manufacturer, with firmware updates at a rival's discretion and Cupertino lawyers lined up around the block, you've only got one way out: innovation. And the crazy thing is, we're actually seeing it happen. The overstuffed sunglasses case Sony Tablet P. Toshiba's new 13-inch gigantor. Acer's dual-screen Iconia monstrosity and Toshiba's Libretto W100 both run Windows 7, but those are two major Android players taking huge risks. It's easy to snark at these malformed, unwantable piles of computing. But at least they're attempts to create something new. These are companies that are throwing millions of dollars at a hunch. Taking huge losses, plowing through dozens of freak machines just to see if something resonates. And you know what? It's working. You know who made the biggest leap forward in tablet design last year? Sony. The Tablet S, for all its faults, made as much sense in your hand as it didn't to the eye. It was comfortable, it was beautiful, it was everything you'd want a slate to be. Except that it was plasticky (that iPad price point is a killer) and the custom UI did more harm than good (those OEM skins again). See that, though? That's what innovation looks like. There's one Android tablet that's made a dent already, of course. But let's hope that Kindle Fire will be the exception, not the rule. The only innovative things about it are its jaw-droppingly low price, and a built-in ecosystem that very nearly rivals Apple's. But it's a flimsy thing, a bargain play. It's a Kia in a world that needs more BMWs. Someday, though, one of the big boy tablet mutations is going to make sense. It might be big, it might be small. It might be fat, it might be round; it might have eight ports, it might have none. But it's only going to happen if manufacturers are willing to take these risks. To crank out the awful, unusable designs that pave the way for the revelatory ones. Should some of them have died in the R&D lab? Sure, probably. But when the non-iPad market is this wide open, what's it hurt to see what sticks? 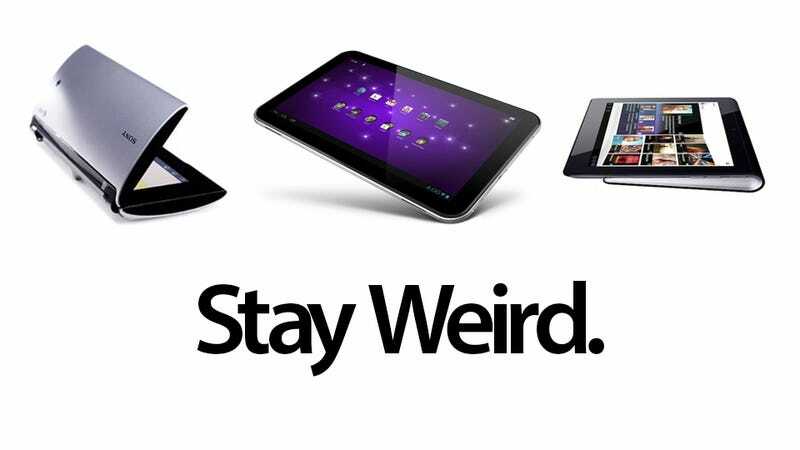 Stay crazy, Android tablets. Stay weird. For all of our sakes.